1 What do swim fins, bifocals, a glass armonica, watertight bulkheads for ships, the lightning rod, and the wood stove all have in common? Give up? They were all invented by Benjamin Franklin. What are some of these things? Why would anyone want to use some of them? Those are questions this story will try to answer. 2 Franklin loved to experiment. In his day, people believed that lightning was a punishment brought by God. 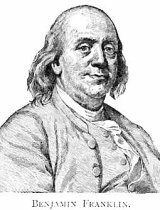 Franklin had been experimenting with electricity and believed that electricity was the source of energy in lightning. He is probably best known for standing outdoors in a storm flying a kite. He attached a metal rod to the top of his kite and tied a metal key on the kite's string. When lightning struck the metal rod at the top, it traveled down through the string. When it reached the key, Franklin touched the key and received a shock. The force of the electricity knocked him unconscious on at least two of these trials. Franklin began installing lightning rods on the tops of the houses in Philadelphia that connected to another rod in the ground away from the house. His experiments had helped him prove that lightning could be directed away from its target. In the 1700s if a house was struck by lightning, it would probably burn to the ground. By putting a lightning rod on the roof, the electricity could be pulled through the rod and the charge carried away from the house. Many homes were saved by Franklin's experiment. 3 By watching frogs swim, Franklin determined that man would be able to swim better if his feet were shaped like those of aquatic animals. He came up with the idea of swim fins in the early 1700s. They were made of wood and shaped like lily pads.